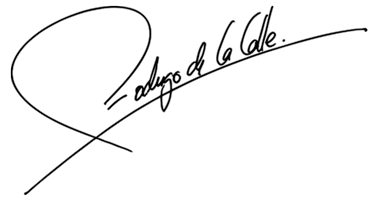 Born in Madrid Rodrigo de la Calle. Son of a farmer and grandson of cooks , spent his childhood surrounded by vegetables and the love of gastronomy. 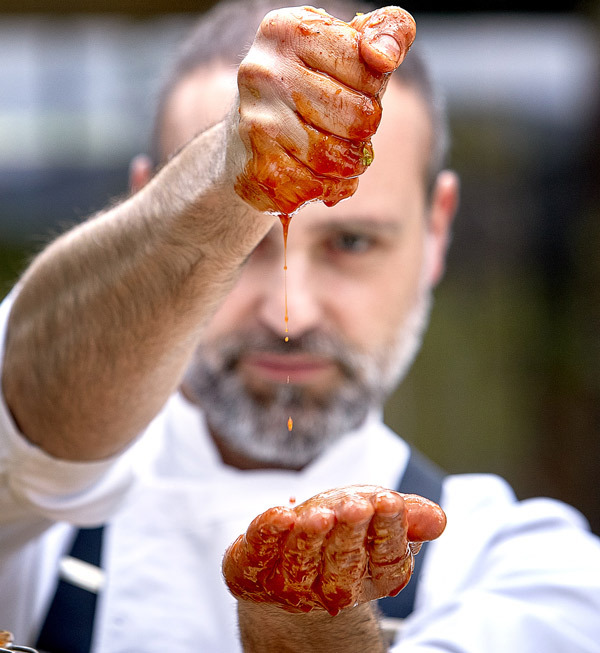 In the year 1994 he began his gastronomical formation in a school of hotel industry in Aranjuez. Once he obtained his degree he passed thru the kitchens of restaurants like Lhardy, Goizeko,Kabi, Romesco o lur Maitea. Destiny takes him to Mugaritz de Andoni Luis Aduriz, this new experience brings him closer to the discovery of a more profound world of vegetables and gives him high kitchen techniques. After passing thru Donostiarra restaurant , and working with master pastry baker Paco Torreblanca, where he learned the discipline and rigorous techniques of pastry and its elaborations. During this year he worked in the old “el Poblet” now Quique Dacosta restaurant where he learned all the secrets of rice and swotted of new concepts esthetics and cutting edge. Finished his formation next the great master Martin Berasategui in Lasarte, he who Rodrigo considers his master and mentor. Till this day you can appreciate the influence of Berasategui in his plates. 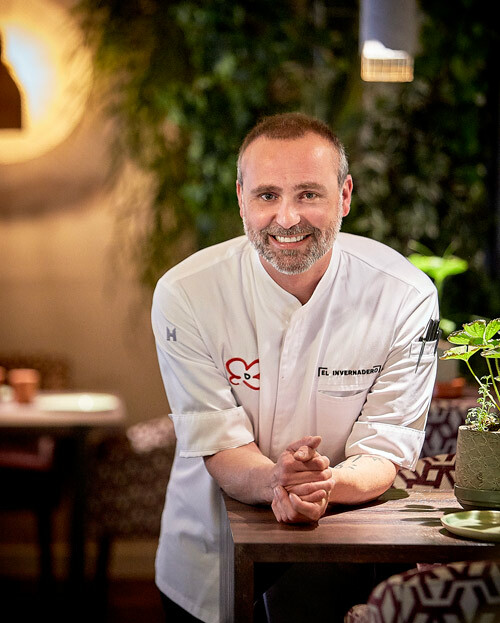 Rodrigo installed himself in Aranjuez and opened his own homonymous restaurant where he offered gastronomy where vegetable product of high season is the protagonist and forged his own style of cuisine based in the respect for nature. His work won him the price of Cocinero Revelacion in Madrid Fusion. Where he presented next to his partner Santiago Orts, the concept of Gastrobotanica in view to the International Gastronomical community . He was named Chef of the Year, prize granted by the Chamber of Commerce of Madrid. He received his first international recognition by hand of the International Academy of Gastronomy was awarded by Chef L’Avenir (Cook Of the Future). This same year he published his book Gastrobotanica where he lifts his philosophy of work and numerous recipes based on the natural product. November 24th of this year he receives his first Michelin star, this same year he was granted the second Sol de la guia Repsol. 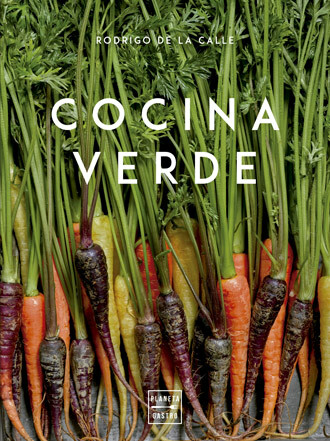 Created the concept of Revolucion Verde elaborating his menu more radically based of fruits vegetable and mushrooms. Utilizing animal protein like mere seasoning component. 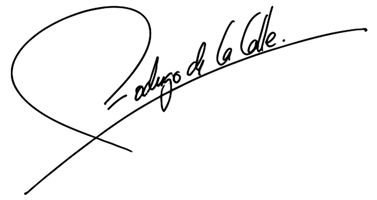 Participates actively in numerous both national and international gastronomic and scientific conferences, Also works as an advisory of multinational companies that devote to the gastronomy sector. Begins his work with fermented vegetables, achieving better texture and reutilizing in his dishes juices resulting from the fermentation. His job of investigating takes him to experiment with super foods incorporating them in his gastronomical creations. From Paris, Rodrigo works as a gastronomic consultant for the prestigious French chef Joël Robuchon – the chef with the most Michelin stars in the world – and more than 20 restaurants open all over the world. 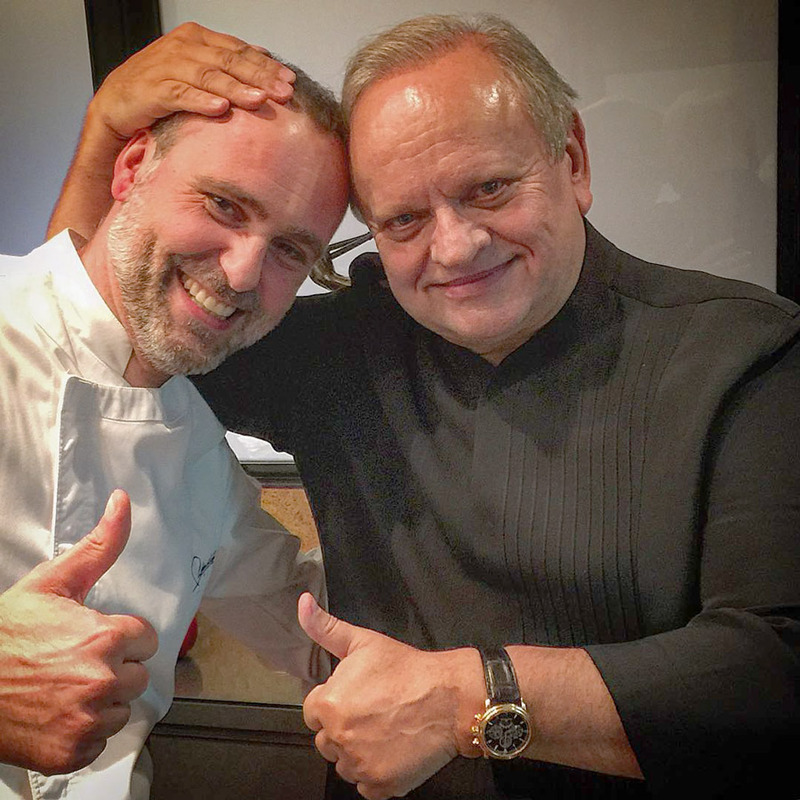 Since the autumn of 2014 Rodrigo travels every station to France to work in the Robuchon laboratory, advising the team on green cooking. Starts formal research of fermented beverages, creating our own drinks. We begin to cook dishes to place in glass. Continues his international expansion with consulting of establishments in Pekin. During the spring inaugurates his restaurant El Invernadero, in full Sierra Madrileña mountains. 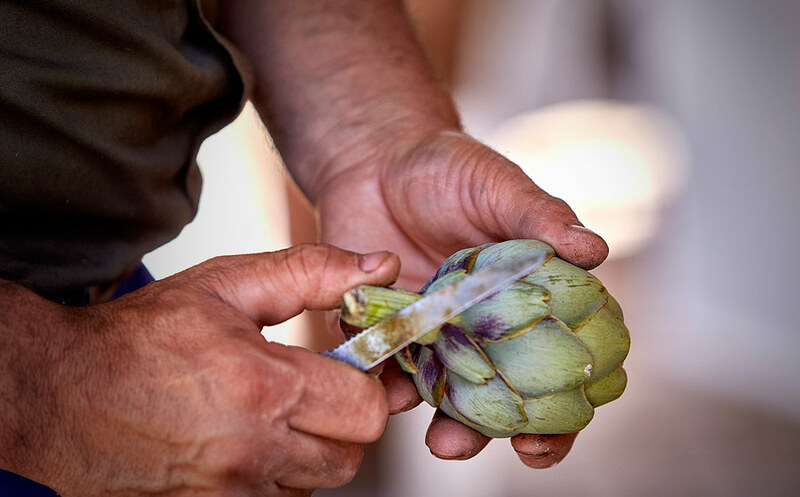 In El Invernadero he develops his most personal cuisine, in wish he continues working with fruits and vegetables of season. El Invernadero restaurant is an unique space with only four tables, where there is no room service. Dishes and drinks of the meny are cooked and served by professional chefs. Creates his new “vegetalia” menu where their latest studies with all kinds of vegetables, flowers, fungi and lichens of high mountain are included, and incorporates Superfoods, fermented and season fruits and vegetables, opening the garden in Guadarrama. In November 2016, just one year after its opening, El Invernadero receives its first Michelin Star and its first Sun in the Repsol Guide. At the beginning of the year, he opened his second restaurant in China, for the group Puerta 20, in the exclusive Lake Romelake, the coolest area of Beijing, dignifying the cuisine of Spanish author, being chosen among the 50 best Western restaurants in China by the Food and Wine magazine. The Metropolis Guide awards El Invernadero as the best restaurant in the Madrid community. Receives the award of the Association 5 a day for his work in the dissemination of plant products. 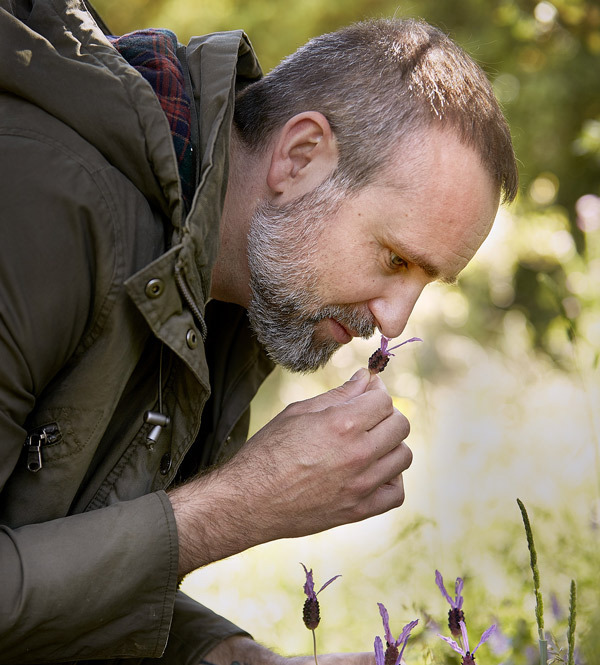 He is awarded the prestigious award in Tudela “The gardener of the year”, (prize they have received: Joan Roca, Juan Maria Arzak, Andoni Aduriz, among others, greats of Spanish cuisine). The American newspaper Washington Post, which designs the list of the 50 best restaurants in the world more sustainable giving importance to the vegetable product, included El Invernadero as one of them. The Spanish Academy of Gastronomy grants Rodrigo, the National Gastronomy Award, for his work in Spanish cuisine in its healthiest version. He publishes his second book “Green Kitchen”, in which he tells the origins of his kitchen and how it has been transformed over time to achieve his personal style that makes him unique. The Madrilenian Gastronomy Academy awards the most innovative project award for its unique concept of restoration. A restaurant with only 4 tables, 8 customers, a single menu with vegetables and healthy cuisine as protagonists. 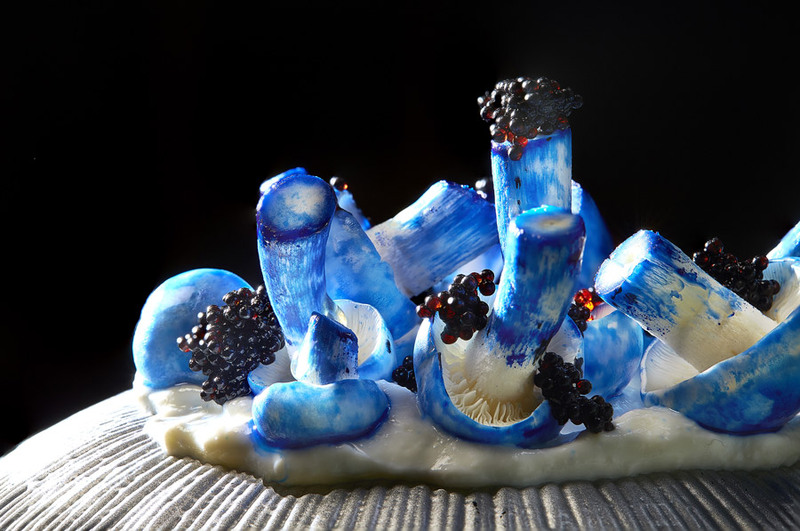 He presents in Madrid Fusion his studies on phycocyanin and its adaptations in the kitchen, creating a new line of work based on this unique product… “The Blue Food“. In May 2018, he opened his restaurant ‘EL INVERNADERO‘ in the center of Madrid, on Calle Ponzano. With a maximum of 20 diners per service, Rodrigo de la Calle keeps his green kitchen proposal with the #Vegetalia menu. Green haute cuisine, recovery of plant species, respect for the environment, integrated cultivation… are still the basis of his proposal. In July 2018, he opened his restaurant ‘‘Paella Power’, in the central market of San Miguel in Madrid. He becomes the first Consulting Chef of the Asian airline Air China, where he is responsible for designing menus for business and first class flights. Within the framework of Madrid Fusion Rodrigo presents its new vegan menus, where it simulates with vegetables: sauces, juices and 100% vegetable backgrounds… with the appearance of classic sauces like demi glace or animal broths. The restaurant El Invernadero will travel during the months of July and August to the prestigious Hotel Metropole considered the most luxurious hotel in the world in Monte Carlo, where it will replicate the Vegetalia Menu that is currently being prepared in its new location in Madrid. The restaurant El Invernadero receives from the Repsol Guide, its second Sol as a reward for the work done in favor of the vegetable cuisine and the way in which the vegetables are dignified and extolled. 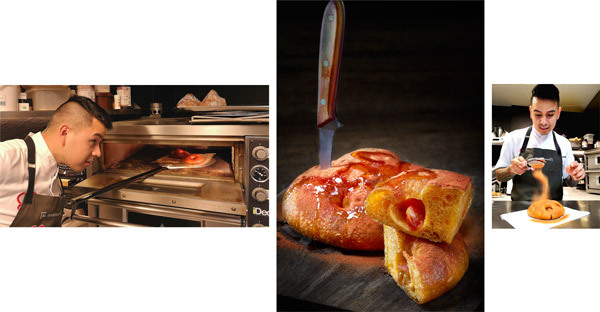 At the beginning of the year the best dishes of 2018 were chosen, in which there was the lycopene bread made by the baker and confectioner of the Green Team Mario Narro from El Invernadero, who makes one of the best breads of the capital every day, recognizing his work as the best bread of 2018.